Andy Robinson’s story is no ordinary testimony. “I got fed up of reading Christian books and there’s this bad person who meets Jesus and then they are a good person. It wasn’t the reality I found.” Andy explains. Born into a strict Brethern family, Andy soon rebelled against his parents' faith. “To me, God had my whole family wrapped around his finger and unless you mentioned God you weren’t really a part of the family. My family loved God more than me and I had a teenage reaction and decided to go my own way. It wasn’t long before Andy made a deal with the Devil. 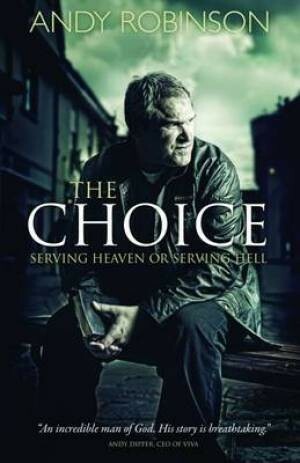 The full story of living on the streets, thieving and ending up in prison is detailed in Andy’s new book The Choice. One of the many results of giving his life to Satan was Andy’s loss of his closest relationships. He cut off all contact with his parents, his later marriage ended in divorce and his closest friends deserted him. As an 18 year old living on the streets, Andy said he was tempted to go into prostitution just to make £30. In the end he chose to rob shops, selling the goods on. The turning point came once Andy had managed to get a stable job. But still on the run from a local gang, his colleague’s invitation of going to church was the best option one Sunday evening. “I can’t remember anything about the service but when I came back to the place I was living, I had the most amazing encounter with God. “I wasn’t high. I wasn’t drunk. For once I was my normal self. It’s so hard to describe, but that was the turning point. Someone asked me the other day 'what does it for you?' I said 'meeting God'. He said 'that’s quite profound'. And it is! “The Lord said, 'let me tell you about my son'. I was on the floor, it was incredible. He told me about how his son had died. It was all love love love. I’d got the Christianity thing completely wrong. I thought it was all about ‘thou shall not’. “It had to be that big because that’s what it took to turn me around. It’s not like I had a choice in that sense. It was an idiot’s choice, a no brainer really. But this moment does not mark either the end of Andy’s story or his book. While Andy acknowledges Jesus power is not even comparable to Satan’s he says the Devil was not going to let him go easily. Spiritual attacks weren’t just verbal, they were often physical. Someone asked me the other day 'what does it for you?' I said 'meeting God'. He said 'that’s quite profound'. And it is! “It was a constant battle. It was alright when it was just me but when it started having an effect on my family it was not so easy to handle then. The images and voices. I spent night after night praying against apparitions and stuff all around me all the time. It’s a reality. Some people still won’t even believe it happened, but it does. “I can clearly remember the elder suggesting I go and pray and read my bible. I picked up my Bible and it was like someone stabbed me in the eye and it burned so much until I put the Bible down then it would stop. It was this physical expression of 'you may think I’m nothing and they may say Satan is nothing but I’m going to prove otherwise'. “Some of these individual battles it was like God saying 'let me show what I can do'. The Lord would triumph even if it took two or three hours of praying. That to me was the difficulty you don’t always read about in Christian books. The power that led to Andy running at his mother with a knife as a teenager wasn’t going to leave him without a fight. Andy says that in some ways he’s pleased it took time to recover from alcohol and drug abuse. He says it allows him to emphathise with those in similar situations. “When you come to faith you do wake up the next day from the euphoria and say 'yeah I still owe 50 grand' or 'that’s great but I still need a heroin fix today' or 'yeah that’s great but have you seen my family or my wife or my boss?' These sorts of issues. To me, there needs to be something to meet that need. Now, Andy’s ministry The Choice Ministries aims to support such people. The book is not there for a nice Christian holiday read, it’s there to change lives. “If you’re not from a Christian family how on earth do you know which Bible to buy or which church to go to or all this sort of stuff? It would be nice if someone rings up and says ‘I’ve just come to faith I’m a 20 year old guy can you help me find a church in Liverpool?’ I can ring round a few ministers and find the right one and be a resource when people come to faith. It’s a missing link. Now keen to speak at churches across the country, Andy believes his ministry is more important than his book. “The idea of the book is to bring each person to that choice. There’s a prayer and help because this is what it’s all about. The book is not there for a nice Christian holiday read, it’s there to change lives. Andy is “chuffed” that people have enjoyed the book so much. He’s even felt the need to apologise that so many have been unable to put it down. “I almost feel a bit bad because they’ve spent £8 and I feel like they don’t get their moneys worth,” he says. If you don’t mind devouring a book within days (or perhaps less), then The Choice is available to purchase here. WIll this be available on Kindle? sorry Dave ive just come across your post yes this is on Kindle..